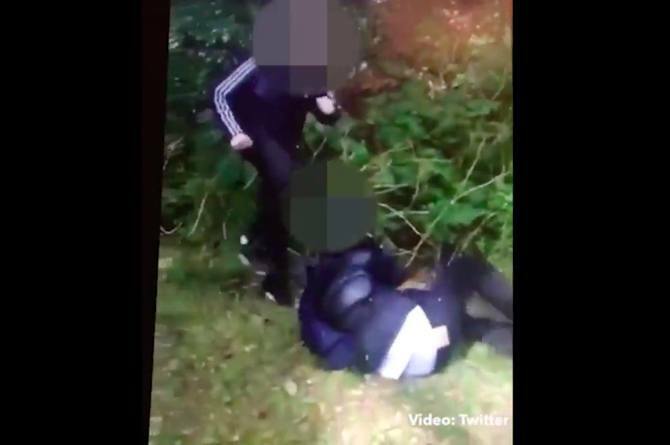 A video recently popped up on social media, showing a group of boys beating up an Asian schoolboy in what was apparently a racially motivated crime. The video shows two boys savagely beating up the schoolboy while others look on. The boy desperately tried to escape his attackers, but they throw him down and beat him while he begs for them to stop. All the while, laughter can be heard in the background. Police have arrested both of the boys involved in the attack, and have called the incident a hate crime. The video of the assault was shared on twitter, which led to the arrest of the two boys, since they were both tagged in the video. The mother of the boy that uploaded the video said that she was aware of the video, but declined to comment on it. Officers from Edinburgh, where the attack happened, are currently conducting an investigation, looking further into the details of the attack. Go to the next page to learn more! In this day and age, there is no place for any form of hatred towards another person, whether it’s racially motivated or for any other reason. Parents also need to talk to their kids and make it a point to discuss that it’s wrong to hate another person for their religious beliefs, skin color, or how they look. Talk about it openly with your kids – Most parents avoid talking about issues such as racism with their kids. It’s important to discuss these issues with your kids so that they can learn about it at an early age. That way, you can avoid misunderstandings early on. Look for opportunities – Find opportunities to teach lessons about racism to your child. You can use a children’s book, so that they can better understand it. Make your examples suitable for their age – For younger children, more abstract examples would be best. For older kids however, talking about events such as slavery, or apartheid will be more appropriate since they would be better able to understand it. Combat stereotypes – Kids might say things that may seem racist without them knowing it. It’s important to not blame your kids, but to focus more on correcting their behavior. Tell them that it’s inappropriate and use it as a good way to teach a lesson about acceptance. Set an example for your kids – You should also be a good role model to your kids. Show your kids that you have friends from different backgrounds and that you are connected with people from all walks of life. Teaching these lessons early on helps your children acquire these important life skills at a young age. This Mumbai-based couple's love story is the best thing you'll read today!